I have to admit that I’ve never been much of a breakfast eater. I usually go for something quick like yogurt or fruit but sometimes I decide to go all out. This usually happens on weekends when I’m not running around in the morning getting ready at full speed. Yes, I am the type of person to sleep in until the very last possible minute (without needing to rush). On weekend’s I’ll sometimes make crepes, bacon and eggs or waffles. Not always the healthiest option but you CAN make it healthy. Plus I find these options very filling and I have more of a brunch than a lunch. 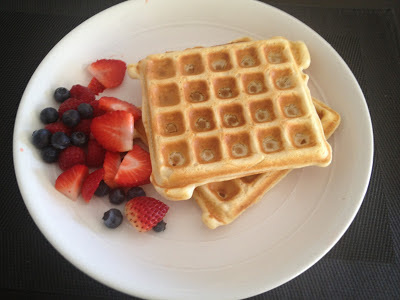 This only happens once every few weeks as I still tend to go for a quick/easy breakfast on weekends too :P.
For my boyfriend’s birthday the only thing he wanted was waffles. He always wants them! Everytime I make them I tend to try one of the first few that pop up on google. I found a good one from allrecipes.com with high reviews. I looked at the ingredients and had everything.. except I noticed one thing. It called for ½ cup of oil. Normally I’d be like meh.. but as I’ve been on track lately it made me go “Woah!” I calculated that and ½ cup of oil was 28 points!!! I almost fell over. That is A LOT! I decided to try something different and instead of using the oil I opted for a single serving size of applesauce which is only 2 points. I saved 26 total points by doing it this way and 3 points per waffle. And it still tasted really good! 5. Cook until golden and serve immediately! These freeze very well and can be enjoyed in the following weeks. This is one of my favourites and I hope you try it :). I like to have a side of fruit with this breakfast.